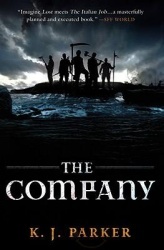 The Company is a fantasy novel without any magic – which is kind of a contradiction in terms. I didn’t realise this when I started reading it, however, so the continual non-appearance of the magical put me off a bit. The book is the story of a group of war veterans who are persuaded by the most senior of them to up sticks and move to an uninhabited island. The reason for this is that the commander of the group was a farmer whose family lost their farm due to an earlier war; now, he thinks colonising this island will be the perfect way to realise his lifelong dream of returning to the land. Another thing that threw me off was believing this commander – Kunessin, the book’s main character – had a hidden agenda … but no, he really does just want to farm. The plan is thrown off kilter by what the men find on the island – but as I indicated, it’s nothing of a magical or supernatural nature. The novel is intended more as a character study than an adventure, but I found the characters all very samey and difficult to differentiate in the first half. Add to this the fact that they all get married to random women (they’re set up by a matchmaker) before they leave, and there are a lot of characters to get to grips with, and the author doesn’t help too much. The book is littered with flashbacks that show the men in their military career and which I found distracting and boring – they take attention away from the narrative and don’t add a huge amount of necessary information. The characterisation is so bland that they also don’t reveal much about the characters – except for one dead one who takes no part in the story. There’s also a backstory that is used to justify a slightly deus ex machina ending. And the ending is odd, and ambiguous. By the time it came around I didn’t much care what happened to the characters. They become increasingly antagonistic towards each other as the strain of their situation takes its toll, and there’s nothing edifying about their struggles with one another. This may be the point of the story, but it seems more suited to a short story than to a novel.